Mobile card readers and payment processing are critical in many commercial and restaurant environments. If you take your goods to fairs, for instance, you need the ability to take payment safely in the middle of nowhere. Food truck owners with a busy route must be able to swipe cards all over the city. Packed atmospheres such as hotels, coffee shops, restaurants, trade shows or any other environment/event may also require servers, managers of business owners who can mobilize their payment processing system. 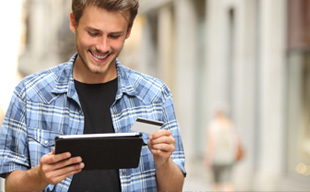 The customer can’t always come to you, so you need the ability to go to them with mobile credit card processing. A POS home base is the traditional model for many shops, restaurants and hotels. But not all industries or small businesses are alike, and while you may even utilize this method, you might also need the ability to go mobile at any time. That’s where our mobile card readers come in, enabling you to accept payments anytime and anywhere from your smart phone or tablet. As if that weren’t enough, Merchant Tree pairs our mobile credit card payment processing hardware with top-of-the-line software that integrates with a variety of payment gateways, apps and marketing tools. Never again will you have to wonder how to give your business the functionality it requires. The ultimate solution is here. Are you ready to take payments anywhere you go? Are you interested in serving consumers with a huge variety of credit card types, in a huge variety of currencies, with a huge number of potential environments at your fingertips? We are extremely dedicated to helping new and small businesses build their brands and profits, and would love to bring our extensive expertise and customizable solutions to your business next. Please get in touch with us today to learn more about our services and how they can benefit your business. Simply give us a call at (800) 610-3922 or contact us today. Your success is just around the corner.